The Belper Passion play due to take place in the town on Good Friday is to be staged indoors, organisers have decided. However due to uncertainty about weather conditions for later in the week and also for safety reasons it has now been decided that the play will be staged indoors. The first act will now be staged inside the Methodist Church at 11.45, followed by a procession to St Peter’s Church where act two will take place. After the play there will be an opportunity to “meet the cast” with refreshments provided. Hope for Belper will be providing practical support to the event and a Hope team will also be on hand at St Peter’s to chat and pray with people afterwards. For the fifth year in a row, a team of volunteers from Hope for Belper handed out more than 100 Easter eggs in Belper Town Centre to accompany the Good Friday walk of witness by Churches Together in Belper. We don’t necessarily repeat projects year after year for the sake of it but this one has always gone down well with people in the town and this year was no exception, although it helped that the rain held off until the end! Some people always seem genuinely surprised to be given ‘something for nothing’ and ask us how much they owe us. My hope is that by this simple act of kindness we are giving a very small glimpse of what God’s grace is like, and that Jesus has already paid the price. Thanks to the wonders of YouTube we’re pleased to be able to bring you our first video on the site! It was filmed by Tim Gossling of Derby ChurchNet during Hope’s handout of hot cross buns and creme eggs in Belper on Good Friday. Cheers Tim! The Hope for Belper team was once again out and about in the town centre on Good Friday handing out Hot Cross Buns and Easter Eggs as a small act of kindness to passers-by. 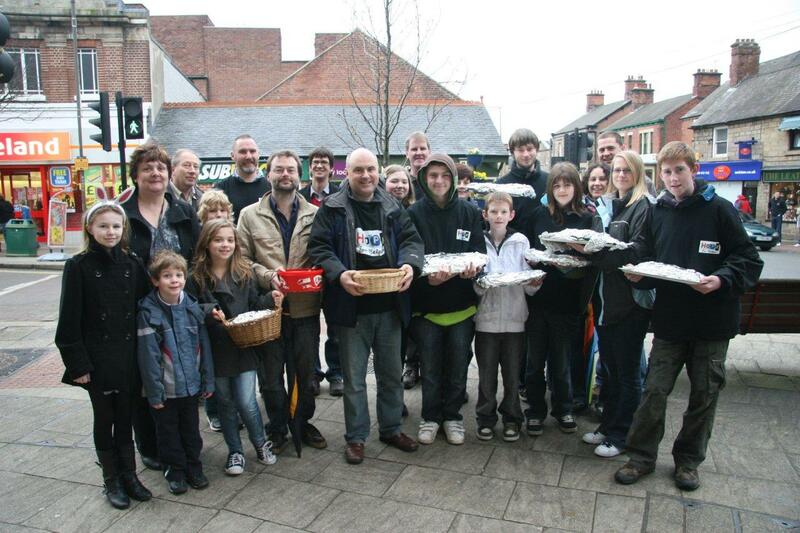 Here’s a picture of those who took part, courtesy of Tim Gossling of Derby Church Net.